Kenny Lattimore | A Kenny Lattimore Christmas - TheUrbanMusicScene.com | Music Reviews! There are a lot of hit-making R&B vocalists who can effortlessly deliver the soulful goods. Yet when it comes to performing a holiday project that stretches across several genres, there are fewer who can successful step out of their comfort zone. Though his calling card is registered in smooth R&B ballads (“Never Too Busy”, “If I Lose My Woman”) and albums registering on the Top #25 Billboard R&B Charts since 1996, Kenny Lattimore sounds equally confident whether the musical mood may dictate; traditional jazz, gospel or world music. After witnessing this classically trained tenor in a recent live setting exhibiting his versatility, especially with an on-point operatic aria, it makes perfect sense that Lattimore could record a Christmas CD with many of the colorful trimmings, sans the sometimes tempting move towards cheesiness. 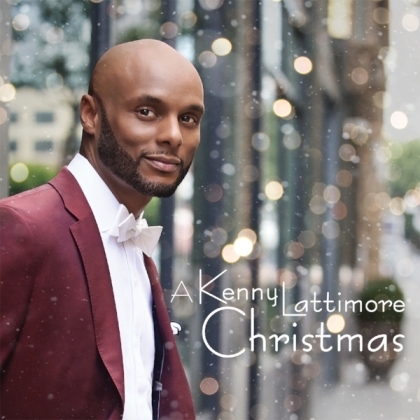 From the sharp looking tuxedo worn by Lattimore on the album cover, to the first rate musicianship and stellar production from Aaron Lindsey, A Kenny Lattimore Christmas drips class personified no matter what the genre and, without hesitation, is one of the finest holiday recordings of the year. “Home for the Holidays” (not the original version) is engrossed in a welcome acapella interlude where the harmonies bounce off each other. Lattimore also takes a risk, yet a favorable one, on “God Rest Ye Merry Gentlemen”, that weaves a smooth jazz/gospel vibe. In further demonstrating his musicality on A Kenny Lattimore Christmas, Lattimore’s rendition of “Have Yourself a Merry Little Christmas” upholds the spirit of this holiday classic, accompanied by a traditional jazz trio. “O Holy Night” is a resounding classically flavored performance and the soft orchestrations of “The Christmas Song” meshes Lattimore’s rich vocals with a tender acoustic guitar solo. The praise and worship portion of A Kenny Lattimore Christmas does not disappoint, either. “Reason to Celebrate” echoes festive African beats and melodies, and remains engaging on all counts for most of its seven plus minutes, while “We Want to See You” is packed with powerful and poignant worship pleas: “I’m forever changed, past has been erased.” In essence, the blips on A Kenny Lattimore Christmas are very minor and do not seriously impede the project as a whole. Just simply enjoy Lattimore’s vocal excellence that provides all the needed ingredients that stir the holidays in a much needed positive direction. Four and three-quarter stars out of five.